In this essay I will estimate the annual contribution to atmospheric green-house gases from methane (CH4) that results from enteric fermentation1 in cattle that graze on U.S. federal public lands. I’ll also compare the CH4 con-tribution of public lands cattle to that of several other sources and sinks of CH4, including emission of CH4 due to oil and gas production on federal lands. The amount by which the public lands contribution to atmospheric CH4 would change as a result of cattle removal is a more complex matter than are the above-mentioned topics. In the absence of ranching operations, the re-covery of native flora and fauna would provide many new sources and sinks of atmospheric CH4. Although a detailed greenhouse gas analysis of such re-covered ecosystems is beyond the scope of this essay, I will note a few factors that such an analysis should include. Based on the measurement that a typical grass-fed cow emits 600–700 liters (L) of CH4 per day,2 the mass of this gas annually produced by cattle that graze on 250 million acres of federal public lands managed by the U.S. Forest Service and the Bureau of Land Management (BLM) can be estimated.3 In the interest of producing a conservative estimate, I will perform the calculation using the lower limit (i.e., 600 L) of a cow’s daily CH4 production. The BLM4 and U.S. Forest Service5 report annual forage utilization from their lands by cattle of 7,920,576 and 6,380,872 animal unit months (AUMs) respectively, with the combined forage utilization being 14,301,448 AUMs. Based on the total number of AUMs used per year and the mass of CH4 emitted per AUM, the annual volume of CH4 produced by public lands cattle is equal to 266,006,932,800 L.7 Since 1,000 L are equivalent in volume to 1 cubic meter (m3), public lands cattle produce 266,006,932 m3 of CH4 per year. • C annually sequestered by 123,992 acres of forest preserved from conversion to cropland. • 4.5 coal-fired power plants for one year. Would Removing Cattle from Public Lands Reduce the Lands’ Greenhouse Gas Contribution? Having determined the quantity of CH4 produced by cattle that graze on public lands, one might ask whether removing these cattle would reduce the greenhouse gas contribution of these public lands by that amount. Although the answer to that question is beyond the scope of this essay, I will indicate a few of the factors that must be considered in seeking the answer. 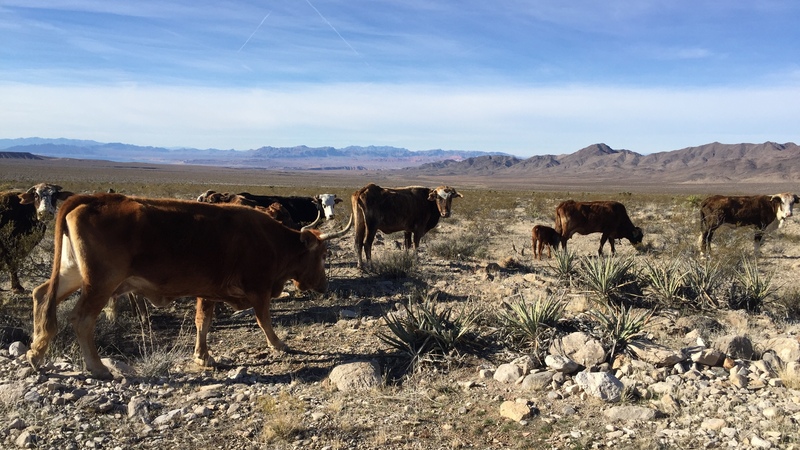 Microbiotic crusts,30 which were once prevalent across deserts of the American West, “can be dominant sources of productivity and C sequestration in extremely dry environments.”31 But more than a hundred years of trampling by cattle has markedly reduced the presence of these crusts. And even when cattle impacts are removed, crusts may require from 40 to 250 years to fully recover,32 depending on environmental conditions. Consequently, significant C sequestration by the crusts may not be achieved until many years after the removal of cattle. Quantifying the biological and chemical processes of these and other greenhouse gas sources and sinks following the cessation of cattle grazing would be a daunting task—one made even more difficult by the need to anticipate impacts on vegetation and wildlife from global climate change. The author thanks T. Shuman for his comments on previous drafts of this essay. /wiki/Enteric_fermentation (accessed 19 July 2015). issions-less-grass-less-gas (accessed 19 July 2015). ww.eenews.net/stories/1060000713 [accessed 5 July 2017]). lic_land_statistics/pls15/pls2015.pdf (accessed 16 May 2017). /grazing-stats/2010sGrazingStatisticalSummaryFY2015.pdf (accessed 16 May 2017). 6. The calculation of 18,600 L (CH4): 31 days × 600 L (CH4) day-1. 7. The calculation of 266,006,932,800 L (CH4) year-1: 18,600 L (CH4) AUM-1 × 14,301,448 AUMs year-1. irliquide.com/Encyclopedia.asp?GasID=41 (accessed 9 July 2017). 9. The calculation of 180,884,714.304 kg (CH4 emitted by public lands cattle): 266,006,932.8 m3 (CH4) year-1 × 0.68 kg (CH4) m-3. .org/wiki/Global_warming_potential (accessed 9 May 2017). /ar5/wg1/ (accessed 13 July 2015). /8/235/2017 (accessed 7 May 2017). 13. Climate Change 2013, 711. 14. Ibid., 719, Figure 8.32. /10.1002/ese3.35/full (accessed 19 July 2015). 16. The calculation of 15,556,085,430.144 kg of CO2-equivalents (over a 20-year interval): [GWP20 (CH4): 86] × 180,884,714.3 kg of CH4. -calculations-and-references (accessed 17 May 2017). l_land (accessed 1 July 2017). -gas-public-lands (accessed 1 July 2017). 20. ICF International, https://www.icf.com (accessed 1 July 2017). 854162-1884747057.1453594421 (accessed 1 July 2017). 22. The calculation of 19.9% of the CH4 emissions from current oil and gas production: 100 × 266,006,932.8 m3 (CH4 from federal public lands cattle) year-1 / 1,336,555,000 m3 (CH4 wasted from federal public lands production of oil and gas) year-1. PreventionRuleFactsheetFinal.pdf (accessed 4 July 2017). 24. The calculation of the CH4 emitted by public lands’ cattle as 113.9% of anticipated reduction of CH4 emitted by public lands oil and gas production as a result of the November 2016 BLM regulation: 100 × 180,884,714.3 kg year-1 / (175,000 tons year-1 × 2,000 lb ton-1 × 0.453592 kg lb-1). %2C_red_dee.pdf (accessed 22 May 2017). 26. The estimate from Note 2 of a grass-fed cow emitting 600 L day-1 of CH4 is equivalent (at previously assumed conditions of 1.013 bar and 15°C) to 408 g, of which 31.5 g emitted by a red deer is 7.7%. 27. See, for example, David Christianson and Scott Creel, “Ecosystem Scale Declines in Elk Recruitment and Population Growth with Wolf Colonization: A Before-After-Control-Impact Approach,” PLoS ONE 9(7) (2014): e102330, https://doi.org/10.1371/journal.pone.0102330 (accessed 2 July 2017). .nlm.nih.gov/pubmed/18396553 (accessed 19 July 2015). .org/10.1371/journal.pone.005543 (accessed 2 July 2017). /Internet/FSE_DOCUMENTS/nrcs142p2_053263.pdf (accessed 7 Feb 2017). ndle/1912/2101/i0006-3568-58-2-114.pdf (accessed 9 July 2017). 32. Jayne Belnap, “Recovery Rates of Cryptobiotic Crusts: Inoculant [sic] Use and Assessment Methods,” Great Basin Naturalist 53(1) (1993): 94. Protect Animals And The Environment. Shoot Republicans. Yes, it does, and if we could put cattle ranchers out of public lands and out of business, then that would be defining long reaching achievement! But cattle ranchers are a vicious bunch with politicians on local and federal level bought and paid for, doing the dirty work for them.